There exist numerous handbooks and good practice collections which illustrate success stories from cities all over the world which have become leaders in active mobility promotion and public space design for people. They provide excellent recommendations to planners and urban designers about how to create healthy places through active mobility, and build more inclusive communities for walking and cycling. The innovation of the PASTA Handbook lies in its original approach for identifying successful measures across the transport planning and public health domains that had a health dimension embedded. Overall 8 good practices are described in case studies. 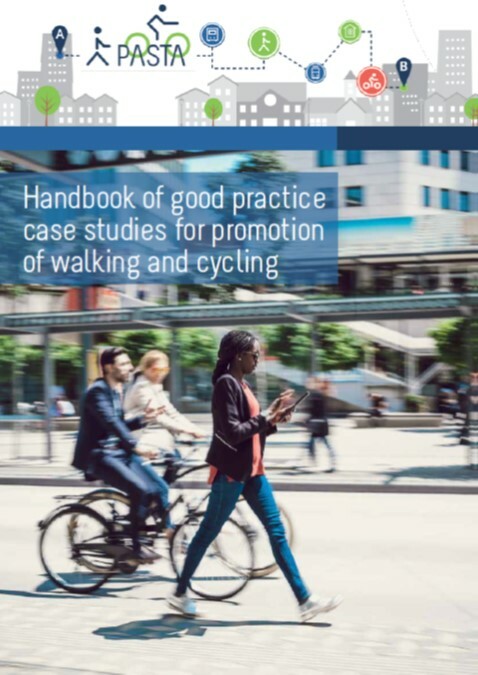 These good practices have specific characteristics of active mobility measures that can effectively support decision makers in a greater uptake of innovative approaches to promote walking and cycling in daily life. By this approach PASTA looks at a larger spectrum on different intervention levels beyond traditional sectors of urban and transport planning and health promotion. Each selected measure has been identified and described with respect not only to the implementation aspects but through an analytical description of the institutional infrastructure and policy environment in which action and the development of the good practice could take place, providing most useful practical information which constitutes the added value of such a search in PASTA. Good practices are described for an expert audience of practitioners and decision makers working in transport and health. The compendium also comprises a list of existing resources, tools and compilations of good practices for practitioners .